Swindon Supermarine Football Club are delighted to announce the loan signing of keeper Will Henry from Swindon Town. The loan deal will be for one month. Will is a young keeper that has been on the books of Swindon Town for after joining from the Bristol City youth set-up. He made his debut for Swindon Town at Rochdale in April 2016 and saved a penalty in the 2-2 draw. 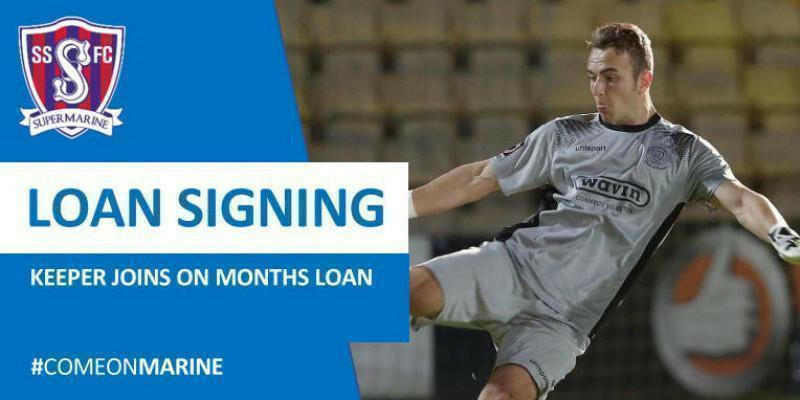 In the past couple of seasons Will has had loan spells at Dunstable Town, Hampton & Richmond Borough and more recently at National League Chippenham Town this season. He will be in the Swindon Supermarine squad that travels to Staines Town tomorrow afternoon. Manager Lee Spalding commented, “We are bringing in an excellent goalkeeper to play initially for a month, as we all know, regular keeper Josh Hill suffered a long-term injury to his shoulder and having Kevin Sawyer come out of retirement to cover for Josh wasn’t a long term solution anyway and we needed to resolve that. We would also like to place on record our thanks to Kevin Sawyer for coming out of retirement to help team through the last month or so and like him, we hope he can now finally put his gloves away.